At Ronald Matsuura, D.D.S we offer the highest quality preventive, restorative and cosmetic dental care. Los Gatos dentist Dr. Matsuura has years of experience in everything from routine dental checkups, fillings, and teeth cleaning to treating more complex dental problems. Call now for an appointment at (408) 354-1717 or just fill out our simple online form. Don't hesitate to contact Ronald Matsuura, D.D.S if you have any questions. We are here to help, and look forward to speaking with you! You can now easily book an appointment at one of our convenient locdations online! PerioProtect has been an FDA cleared MEDICAL device since 2004. It has won 4 awards, including 2006 Product of Distinction, and the top 100 products awards by Dentistry Today in 2009, 2010 and 2011. 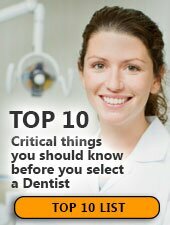 Over 4500 dentists (and growing)have taken Perioprotect's certification course and thousands of dentists are offering this medical device in their dental offices, including over 150+ periodontists or gum specialists, who as a group may be most threatened by this possible alternative and option to gum surgery. Thinking of implants to replace teeth and/or stablize dentures? Thinking of getting teeth straightened for you or a loved one? Thinking of having the most youthful smile in just a few visits? Call for a free consultation 408 354-1717 or click the link below to view more information about our Dental Implants & Porcelain Veneers. And of course we offer implants to replace most any missing tooth and teeth and to replace teeth that cannot be restored conventionally. We are conveniently located off of Hwy 880 and Los Gatos/Saratoga Road (Hwy 9) going west. We have a second location in Sunnyvale if that is more convenient for you at 990 West Fremont Ave Suite O, right off of Hwy 85/Fremont exit near Hwy 280/85 exchange. Welcome to our practice!. I am proud to have been serving patients in our community for over 30 years. The combination of continuing education and state-of-the-art equipment allow us to offer you and your family the high level of care you're looking for. My team and I will give you a warm welcome and our ongoing commitment to your dental health. I was born in Colorado and lived in California since I was three years old. I grew up in Palo Alto, California and went to Gunn High School. After graduating in 1970, I attended UCLA for my Bachelors degree in biology and then attended University of Southern California (USC Trojans) graduating in 1979. I have been practicing dentistry since 1979 and in Los Gatos on Monterey Avenue since March of 1981. I love dentistry, more and more each year with all the wonderful advances and modern technologies. I look forward to see you all! Dr. Ronald Matsuura and his friendly team are committed to helping your receive the personalized dentistry care you need. At Ronald Matsuura, D.D.S our staff is trained in the latest techniques. If you need to find a dentist contact us at (855) 548-8465 for a map, office hours and directions. We're looking forward to helping your learn about your options for affordable dentistry. © 2017, Internet Dental Alliance, Inc. All Rights Reserved.